This is the main page for extreme games. 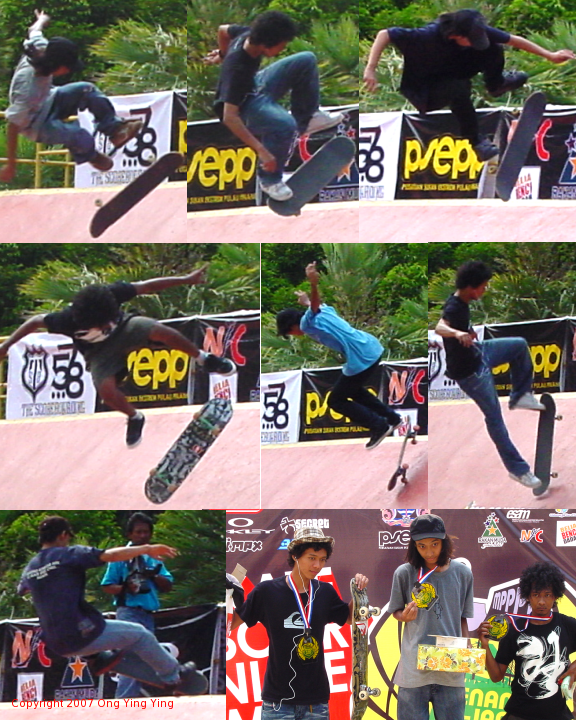 Land extreme games consist of a few events like inline skating, skate boarding, bicycling presentation and artificial 'rock climbing'. This sport is interesting to watch. This sport is mainly for self-satisfaction kind of activity because before those competitors can perform their stunts, they would have fallen thousands of times. And the monetary reward is very small. Inline skating is skating wearing skates that have 4 wheels in a straight line attached on the skates. So the skaters are actually standing on 8 wheels, 4 wheels under each leg. For this event, the skaters will have to perform stunts like turning themselves in mid-air and jumping and skating on side-walk railings, tables and benches. For skate boarding, the skater will push his /her skate board and then stand on it. The skaters will have to do lots of stunts in competitions like kicking and flipping their skate boards and jumping onto benches, etc. So, for this event, the skaters will have to make sure that their skate boards 'stick' to their feet when they perform jumping and be able to turn their skate boards when they are air-bond. 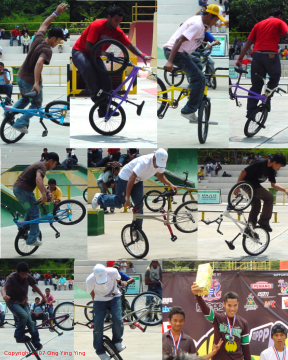 'Bicycling presentation' is performing stunts using bmx bicycles which are nade for extreme game. The cyclists will have to do stunts on one wheel, moving themselves from the seat to the front wheel and to the back wheel, turning their bikes in circle on one wheel and turning in mid-air. As for artificial rock climbing, the climbers will pit against themselves to reach the top first.